Extant research provides equivocal conclusions if the combined presentation of health anxiety with severe somatic symptoms confers risk for greater future primary care usage. The present study further examined the combination of health anxiety and somatic symptoms as a predictor of healthcare usage in primary care. Using a prospective longitudinal design, a large sample (N = 530) of patients presenting for treatment at a community health center completed self-report measures assessing health anxiety and somatic symptom severity. A medical record review at the time of questionnaire administration and 1 year following that administration was completed to assess the frequency of medical visits during the preceding and subsequent year. As expected, the interactive effect between health anxiety and somatic symptom severity predicted greater subsequent year medical visits. Covariates included preceding year medical visits, sociodemographic variables, body mass index, smoking status, and depressive symptom severity. 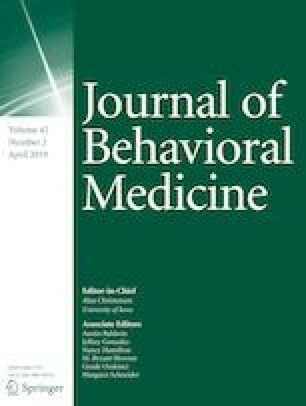 Simple effects indicated that health anxiety predicted greater subsequent year medical visits when coupled with relatively severe, but not mild, somatic symptoms. Assessing health anxiety and somatic symptom severity in primary care settings could be important for identifying individuals at risk for future frequent healthcare visits and who may benefit from intervention. Thomas A. Fergus, Lance P. Kelley, and Jackson O. Griggs declare that they have no conflicts of interest.